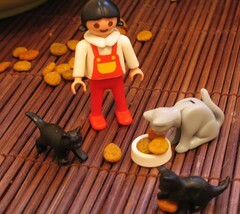 CRAZY CAT LADY PLAYMOBIL FROM GROC!! Oh, and for the record, I’m not eschewing men for felines. That’s only THREE cats m’dear. Surely you’ll have six or seven? Heck, even Clamb’s got four. Watch out. First it’s a few cats. Then the knitting things for all your friends. Next thing you know, you’re sitting at home in one of your many pairs of sweatpants, searching the couch for spare change to buy more Scratch’n’Wins.